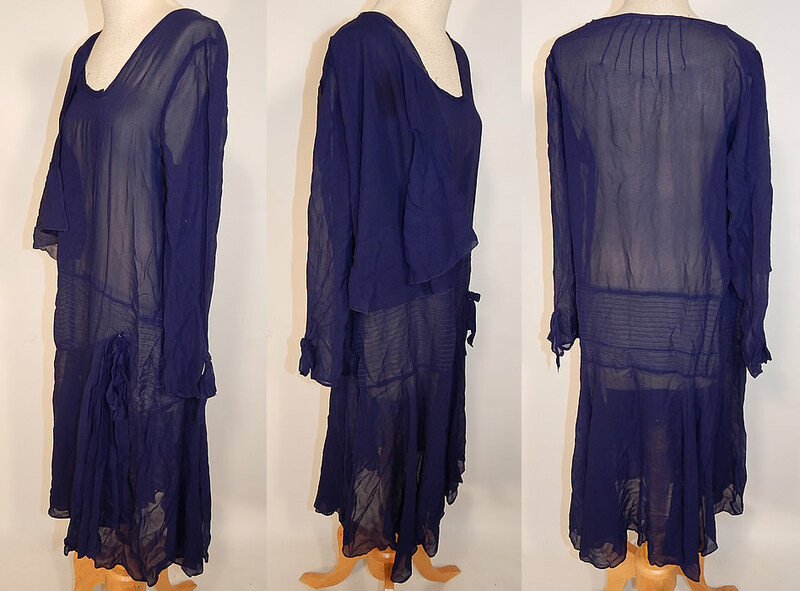 This vintage navy blue silk chiffon capelet asymmetrical drop waist dress dates from the 1920s. 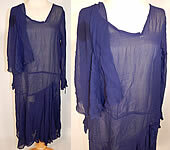 It is made of a navy blue sheer silk chiffon fabric, with decorative pleated stitching details. This delightful day dress is loose fitting, with a drop waist, shoulder capelet attached onto one side, an uneven asymmetrical neckline and skirt, front drape skirt panel with side bow trim, long sleeves and is sheer, unlined. The dress measures 40 inches long, with a 36 inch waist, 36 inch bust and 21 inch long sleeve. It is in good as-is condition, with a few tiny holes on the back top, capelet, sleeve cuff and a stain on the shoulder capelet (see close-up). This is truly a wonderful piece of wearable art!